world’s first-ever online encyclopaedia of public international law applicable to weapons. … [it] aims to provide accurate, up-to-date information on weapons, the effects of their use, and their regulation under international and national law…. Glossary summarizing concepts of weapons law. 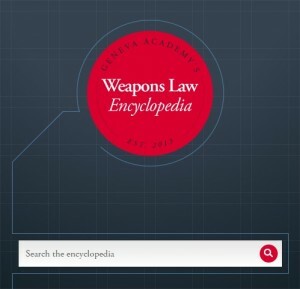 The Weapons Law Encyclopedia can be browsed by the identified categories, searched using free text search and results can be filtered by the identified categories. Additionally, each category can be browsed or searched. When displaying the weapons listing category, entries are further subdivided into legal regulation, main injury or damage mechanism, and policy theme categories. Treaties listing category is further subdivided into arms control and disarmament, International Humanitarian Law, and Terrorism categories. Case Law listing entries are further subdivided by courts: ICJ, Int’l Criminal Tribunals, National jurisprudence, Regional Human Rights bodies, and others. Lastly, glossary listing is an alphabetical listing of entries.